For Exemplary Courage in Coming to the Aid of a Police Officer Under Attack. Conservation Officer Michael Binkley was presented with a Police Services Board Commendation from the Sault Ste. 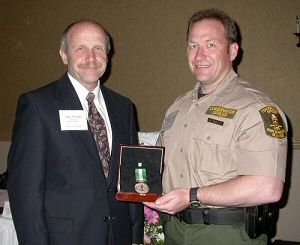 Marie Police Service in March 2004 for his role in aiding a police officer who was under attack. 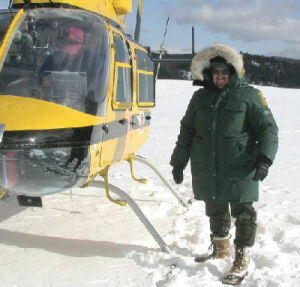 Mike’s valiant actions have also earned him theMNR Valour Award, and the NAWEOA Valour Award. The MNR Valour Award was presented to Mike by the MNR’s Deputy Minister Gail Beggs, at the April 29, 2004 P.R.I.D.E ceremony in North Bay. Mike’s nominator, and the new Director of MNR’s Enforcement Branch, Serge Tenaglia was also on hand to honour Mike, as seen in the photo. The events leading to these awards, occurred on November 5, 2003, when Conservation Officer Mike Binkley was in the vicinity of the bus depot in the City of Sault Ste. Marie, Ontario. During the arrest of a male person, a Sault Ste, Marie City Constable was assaulted. During the confrontation the assailant attempted to take the officer’s firearm from his holster. As this struggle ensued, Mike Binkley having observed the confrontation and without regard for his own personal safety, went to the assistance of the Constable. This quick reaction resulted in the safe and immediate arrest of the assailant. The MNR’s Sault Ste. Marie District office received a letter of commendation from Robert Davies, Chief of Police acknowledging Mike’s efforts and the risks taken. 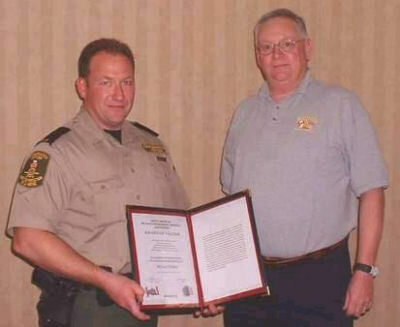 Mike Binkley applied the training he received as a Conservation Officer. Specifically, he used the self defense techniques taught to him to subdue aggressive and violent persons. An additional person did arrive to assist Officer Mike Binkley and Constable Carson. That assistant arrived after the assailant was subdued and handcuffed. One can only speculate at the full scope of the hazards that Mike may have faced. Physically, subduing anyone could result in personal harm. If the assailant was successful in securing the Constable’s sidearm, more serious and dangerous hazards may have faced the officers involved, not to mention other bystanders. At a joint Enforcement/Northeast Leadership Team meeting held in Sault Ste. Marie on October 27, 2004, Officer Binkley was also presented with a NAWEOA Valour Award from Pat Brown, on behalf of the North American Wildlife Enforcement Officers Association. Congratulations to CO Binkley for both his valiant efforts and this much-deserved recognition.